The legendary Hansa Studio is located in the heart of Berlin, directly on Potsdamer Platz. In a Berlin office building, built in 1912, brilliant recordings have been made since the early sixties from countless artists like David Bowie, Depeche Mode, U2, R.E.M., Peter Maffay, Nina Hagen and Udo Jürgens. As times changed, so did the Hansa Studio and in the nineties the decision was made to reduce the number of studios. 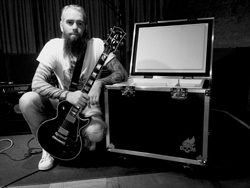 Hansa Studio got introduced with the Box of Doom, during the album recordings (late 2013) of In Flames "Siren Charms". The band requested a BoD in the studio, with as result that the BoD never left the building. Speakers: Celestion V30 | 16 Ohm, Creamback 65w | 8 Ohm.